With protests erupting across the country this week and emotions running high, American companies are trying to make sense of how to react to a Trump presidential election win. But one major company has clearly made up its mind and just came down squarely in the anti-Trump camp in a big way: Donald Trump will be added to Disney’s Hall Of Presidents, but his animatronic figure will be able to feel pain. Given that Disney’s software makes the animatronic believe its bones are shattering each time it moves or speaks, this company clearly wants people to know it’s not onboard the Trump train. 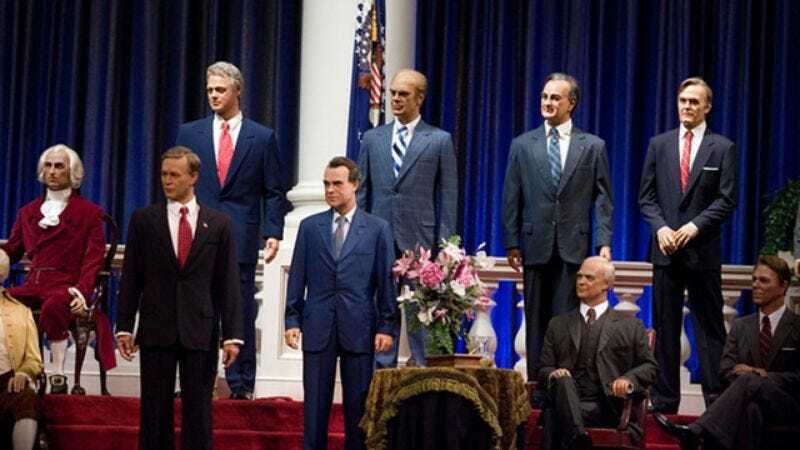 Park visitors who feel similarly opposed to Trump’s presidency can rest assured that his Hall Of Presidents double will be designed to experience anxiety, so it’s always aware that more pain is coming. Although the machine will understand what joy is, its programming will never allow it to feel that. And Disney’s not letting Trump off the hook there. The replicas for Abraham Lincoln and George Washington will even be reprogrammed to slap, scratch, and pry the fingernails off the animatronic Trump, which will respond to such painful stimuli by gasping, crying, screaming, vomiting, or a mix of all of these. If that doesn’t send a powerful statement about where Disney stands politically, we don’t know what does. It’s safe to say we won’t see the Trumps vacationing there anytime soon. Don’t share Disney’s disdain for a Trump presidency? You may be better off heading to Space Mountain instead of the Hall Of Presidents, because Disney has officially drawn the battle line right there.